Shared jokes whose origins are now lost to time, allegiances that shift almost imperceptibly but catastrophically, kindnesses extended and rebuffed, and musings that swing from the mundane to the profound and back again. All this is contained in Sarah DeLappe’s The Wolves, which comes to Belvoir in a production first seen at the Old Fitz last year. 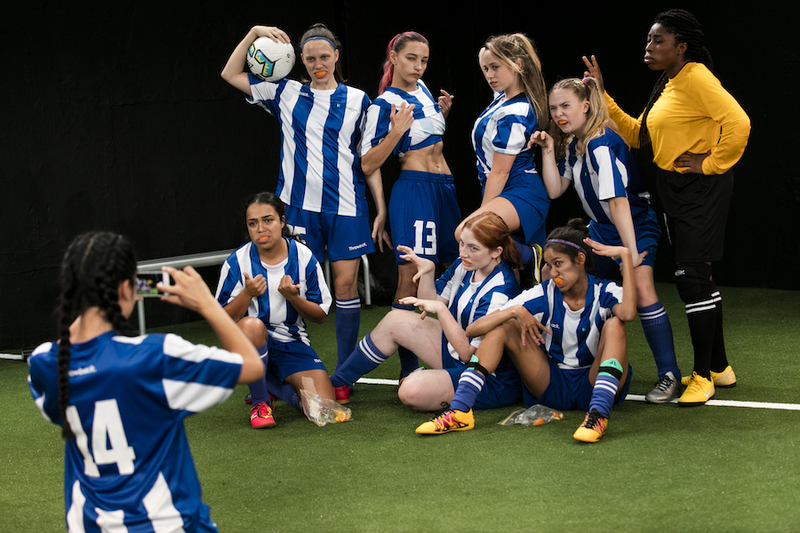 A finalist for the 2017 Pulitzer Prize for Drama, it’s a rich portrait of a girls’ indoor soccer team (‘The Wolves’ of the title), capturing all the awkwardness, pain and joy of soon to be shed adolescence. 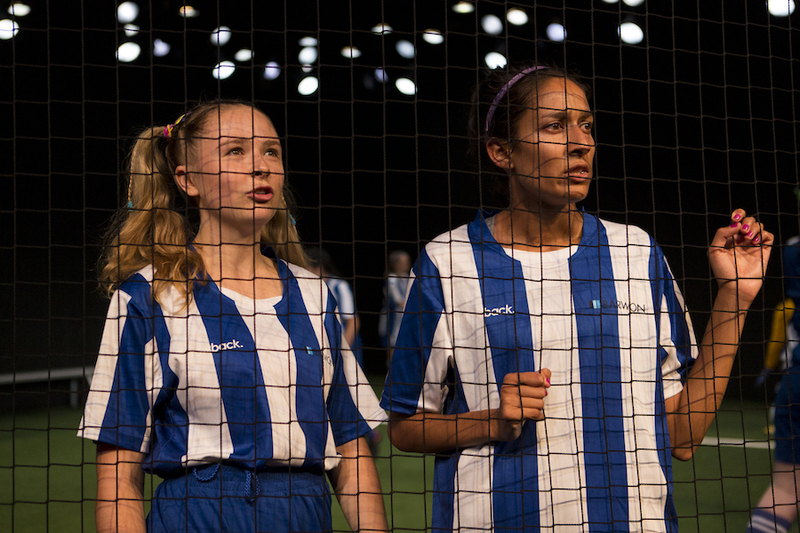 Sensitively and agilely directed by Jessica Arthur, the first thing you notice is how the audience is intentionally distanced from the characters by a black net, which runs all around the patch of turf they lay claim to. It’s an important distance, because it’s only in the company of other young women that our characters feel able to speak and act as they do. The occasional intrusion of the outside, adult world – the appearance of their perpetually hungover coach, or a parent – sees marked shifts in behaviour and comportment, the discarding of female traits looked down on or mocked. It’s a clever way to signal that these young women know keenly the feeling of being watched, of having their every action surveilled and picked over. DeLappe refrains from naming her characters, with the girls referring to each other by the numbers on their jerseys. This means we pay closer attention to their speech and silences, at who and what they align themselves with or disavow. Dialogue is this play’s greatest strength, and there’s plenty of it, frequently overlapping and funny – the perennial tampons versus pads debate is introduced within minutes of curtain up. It’s a delight to see onstage that young women are just as smutty and silly as boys have traditionally been allowed to be, and there’s joy also in witnessing the kinds of behaviours sanctioned and encouraged in female circles. Most apparent is an uncomplicated freedom and comfort with each other’s bodies, whether unthinking or affectionate – short hair is stroked in amazement, shoulders are gripped in excitement. It’s a sweet and realistic counterpoint to more negative behaviours, gleeful gossip often verging into cruelty being the main one. But DeLappe never seems to judge her characters, as if to say that young women are unfairly demonised for conduct they’re often socially conditioned to adopt. Here, wounded feelings are channelled into passive aggressive barbs, and discomfort aroused by an individual’s extreme social awkwardness channelled into painful forms of exclusion. When this production first ran at the Old Fitz, one of the main criticisms was directed at the strength of the overall performances (the cast for Belvoir remains largely intact). Having not seen that run myself, I can only assume that the ensemble work has been honed to a startlingly high degree as everybody involved currently exhibits a shining spontaneity. The actors portraying the young women are Brenna Harding, Emma Harvie, Chika Ikogwe, Sarah Meacham, Sofia Nolan, Michelle Ny, Cece Peters, Nikita Waldron and Nadia Zwecker. All of them inhabit their characters with acute sensitivity, meaning that DeLappe’s intentional borrowing of archetypes – the one with the eating disorder, the high-strung perfectionist, the sexually precocious one – is well-handled and given the necessary dimension. And without giving too much away, Renee Lim’s brief appearance as the play’s sole adult character is rightfully moving. Though The Wolves is not a perfect play – an 11 o’clock tragedy will be effective for some, cheap for others – DeLappe’s realisation of female adolescence is. Our final glimpse of the girls huddled close together for their pre-game cheer, quiet first and then exultant, embraces all the mingled pain and ecstasy of nascent womanhood. You can’t help but be moved. The Australian playwright shares the "carry on" in her new Molière adaptation, now playing at Darlinghurst Theatre Company. Justin Fleming puts Wagner, Hitler and Cosima Wagner on stage in his new play Dresden, which explores human creativity and destruction. A complex love letter to Sydney, Alana Valentine’s new play tracks the lives of three generations of working class women.